This is a regular or high rolling stand. 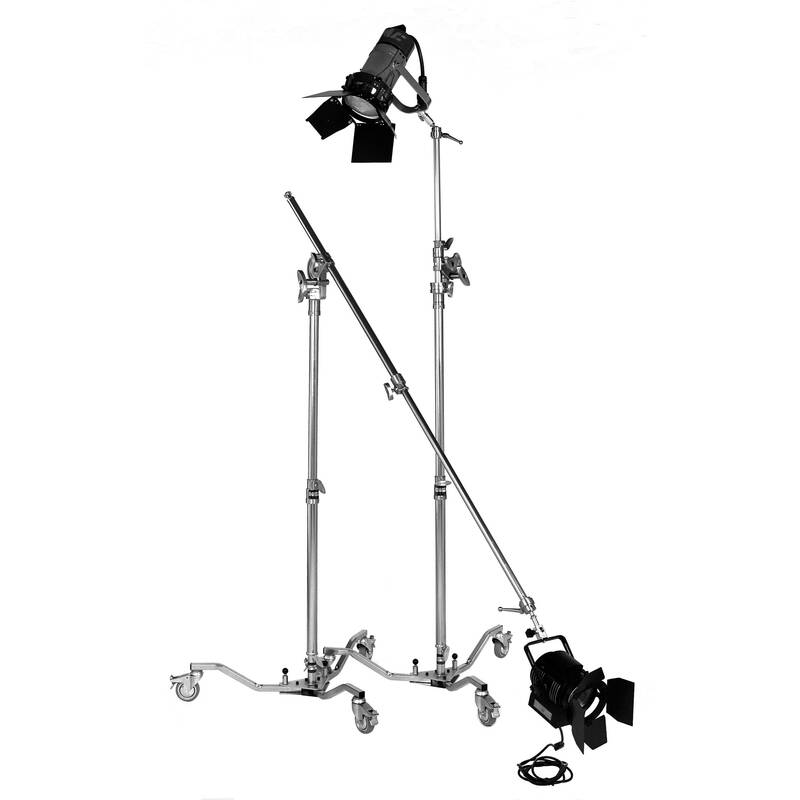 It can also convert to a 2 section light boom with its own rolling stand. The riser alone may be added to a Combo Stand as a very unique stand extension. This is a Matthews Magic Stand Riser Column. It is a 2 section, telescoping riser with Griptonyte finish, and may be added to a Combo stand as an extension, or as is, for a portable light boom. This column extends from 4.5 - 12.5' (1.4 - 3.8 m). This really low rolling stand base was designed to work with the Magic Stand®, but it is also capable of handling any large light fixture mounted directly into its 1-1/8" Posi-V-Lock female receiver. Box Dimensions (LxWxH) 54.0 x 8.0 x 8.0"
Box Dimensions (LxWxH) 19.528 x 6.457 x 6.221"
Magic Stand, Wheeled Runway Base is rated 4.8 out of 5 by 4. Rated 5 out of 5 by Linden from Get this early in your career! Get this Magic Stand early in your career 'cos its going to be with you for a long, long time. See the video on YouTube and everything they say about this stand being a 'big deal' is true. Intelligently designed; beautifully crafted and solid as only Matthews would make them.... you will love this stand. Although a heavy object, the stand glides smoothly and is a joy to use. Whether as a vertical stand or as a sturdy boom - the MS is a real boon to any kind of studio. The folding stand-base and removable column make this easy to relocate away from the studio and set up is quick and solid. The Magic Finger is truly magic and available separately, I am buying more of these for use around the studio & location. Well done again Matthews & B&H. Thank you. Rated 4 out of 5 by TCC from Wonderful Very solid piece of equipment. Right when you take it out of the box you know that it is something you get what you pay for. Runway base rolls smoothly, easy to setup and effortlessly collapses. When converted to a boom and depending on the weight of the pieces on the end, it might be difficult to raise/lower the riser. I wish that the riser would go higher when in boom mode (remedied by using the magic stand in regular mode and attaching mini matth boom) but other than that the magic stand is one piece of equipment I am glad I had spent the money for. Rated 5 out of 5 by blue johnny b from Versatile, Substantial and Excellent Sta This stand is heavy compared to many of my photo light stands but it is much more versatile. It can be configured in many ways. It works well with large soft boxes and can function as a boom for overhead lighting but the vertical height is limited when converted to a boom. Rated 5 out of 5 by Ralph S. from Love it! It's not often that you find a piece of equipment as well thought out and built as the Magic Stand. It's well worth the price and I'm sure it will outlast me by many years. By the way it's heavy-duty!